We are one of India's leading travel service providers of Temples and Tribes Tour, specialized in providing customized travel services to tourists visiting the Indian Sub-Continent. Bhubaneswar is the capital of the ancient kingdom of Orissa, and is famous as the Temple City of India. 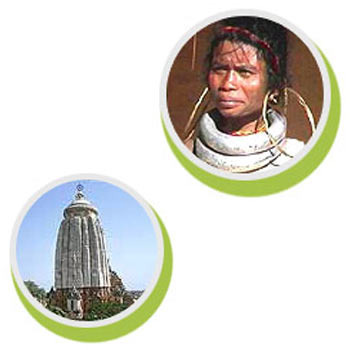 Traveling through the state of Orissa is a blend of art, architecture and ancient cultures. During the festival the renowned dancers and exponents in Odissi style of dance perform in the evening in front of Konark temple. Odissi Dance, which originated in Orissa, is one of the most elegant classical dance styles performed. Lets explore all the temples with Beyond Boundaries world class Itinerary. Morning drive to Bhubaneswar airport (driving distance 60 km, driving time 1 1/2 hours visit) for taking onward connection. En route visit the craftsmen village at Raghurajpur, famous for Patta Chitra (Painting on silk) and at Pipili for Applique Work. Looking for “Temples and Tribes Tour”?